This is the last milestone release for the 1.2 version. It's packed with new features and improvements. The next version will be 1.2 RC 1 and will focus on improving the stability. The roadmap is to release 1.2 final for beginning of December 2007. Main changes are listed below. We've completely redesigned the UI for managing permissions and groups/users. It's now a nice Ajax interface which scales to any number of users. A new Mail Sender plugin has been added. It's a generic plugin that you can use from Velocity/Groovy pages and that is also used by the Watchlist feature below to send notification emails. New Watchlist feature which allows watching pages and spaces and receive email notifications when they are modified. 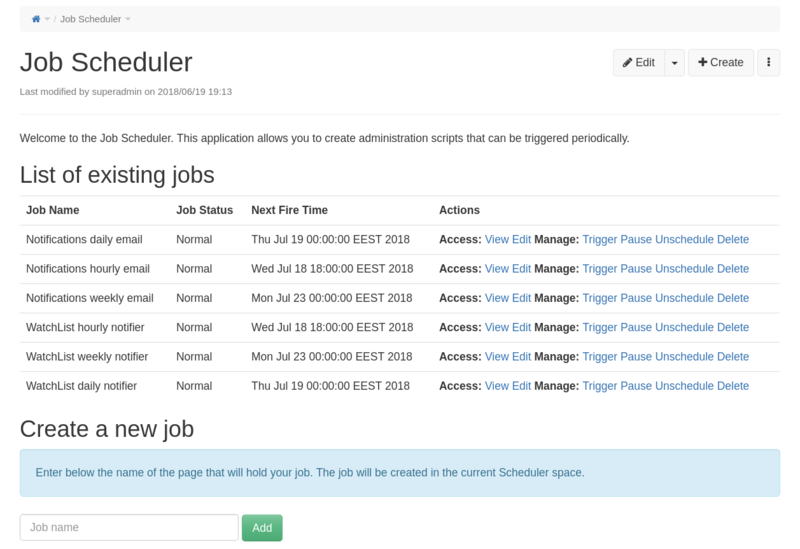 The Scheduler Plugin and the Scheduler Application have been released in version 1.1 and are bundled with XWiki Enterprise 1.2 milestone 2. They allow you to create jobs (Groovy scripts) to be executed in the future. They are used for example in the Watchlist plugin to send email notifications for pages or spaces you are monitoring. New displayPanelLayout Macro to display Panels in page. New JODA Time plugin to allow using JODA time from Velocity/Groovy pages. The top level edit menu has been reorganized. Separators have been added, the Rename and Delete actions have been moved in an Action menu and a new Watch menu has been added. Entering URLs such as http://myserver/xwiki goes to the Main.WebHome page by default (it used to display some installation instruction page). Panels from other virtual wikis can be used now. Lucene Search UI and stability has been improved. Removed the Presentation application from the default wiki (since it was not maintained and was buggy). The database structure has been changed but we have set up an automatic migration system so you shouldn't have to touch your Database to upgrade to 1.2M1. Thus you can simply install this version and configure it to point to your existing database. However you may want to import the default wiki XAR in order to benefit from improvements listed above. Check the release notes for 1.1.1.